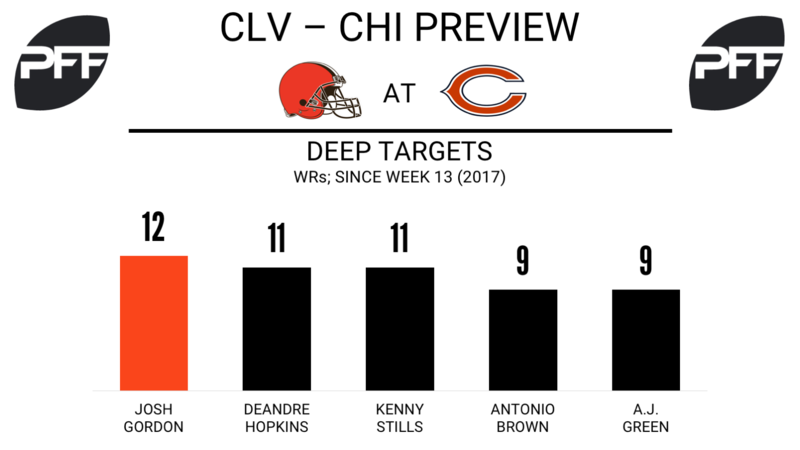 WR Josh Gordon vs. CB Kyle Fuller — Gordon has been targeted heavily on deep passes (those traveling 20 yards or more in the air) since his return in Week 13, with his 12 deep targets leading all wideouts over the past three weeks. Many of those targets haven’t given him a chance to make a play, but Gordon has pulled in all four catchable passes for 123 yards and a touchdown. Fuller has been one of the most targeted cornerbacks on deep passes this season, but has held up well on those targets. Opposing passers have completed just six of the 20 deep passes thrown Fuller’s direction, with no touchdowns, an interception and four passes defensed. G Kevin Zeitler vs. DI Akiem Hicks — Hicks has been one of the NFL’s best run defenders this season, earning an 87.8 run-defense grade that is tied for 11th-best among interior defenders. No other defender, regardless of position, has made more run tackles within two yards of the line of scrimmage to prevent a first down than Hicks, who has done so 31 times. With Hicks lining up almost exclusively on the left side of the defense, it should be Zeitler who is responsible for blocking him on most snaps. Guard play has been one of the few bright spots offensively for the Browns this season, with Zeitler joining teammate Joel Bitonio among the 10 highest-graded guards this season. Zeitler ranks in the top-15 in both pass blocking (83.7, 11th) and run blocking (77.8, 15th). QB DeShone Kizer when kept clean — Chicago has struggled to get after the quarterback this season, pressuring the opposing passer on just 30.8 percent of dropbacks, the fourth-lowest rate in the league. The ability to operate without pressure has been key to Kizer earning his three best game grades of the season since the Browns’ bye week. Prior to the bye week, Kizer posted a 56.5 passer rating when kept clean (worst). Since the bye, that’s improved to 82.5 despite playing three defenses that rank in the top-six in PFF’s coverage grading this season (Jaguars, Chargers, Ravens). WR Kendall Wright vs. CB Briean Boddy-Calhoun – Wright is the Bears’ highest-graded receiver at 78.3 overall, good for 32nd-best in the NFL. He’s caught 69.2 percent of his targets since Week 5, the highest on the team, and he hasn’t dropped a pass over that span. Over the last two weeks, he’s averaging 2.94 yards per route run, the fifth-best rate among wide receivers. Boddy-Calhoun has quietly been one of the league’s best slot cornerbacks this season. His 85.3 overall grade is the best in the Browns secondary and the 19th-best among cornerbacks. He leads all slot cornerbacks in coverage snaps per target (9.3), coverage snaps per reception (19.5) and yards per coverage snap (0.41). 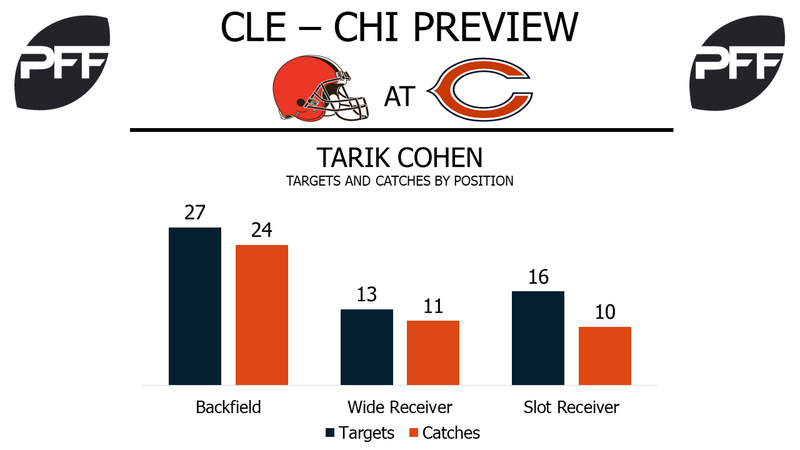 RB Tarik Cohen vs. LB Christian Kirksey – Cohen has split time at running back and wide receiver this season, with only 55.1 percent of his snaps coming in the backfield. 29 of his 56 targets have come while lined up at a wide receiver position, and he’s second among running backs with 21 missed tackles forced after the catch. Kirksey has a career-low 51.0 overall grade this season, particularly struggling in coverage. He is the most-targeted linebacker in coverage this season with 92 targets, and he has allowed the most catches (76) as a result. He and teammate Joe Schobert have allowed five touchdowns in coverage this season, tied for the most among linebackers. T Charles Leno Jr. vs. Edge Myles Garrett – Leno’s 82.0 overall grade this season is a career-high and good for 11th-highest among offensive tackles. He has allowed two sacks, three hits and 15 hurries on 465 pass-blocking snaps, giving him a pass-blocking efficiency rating of 96.7 that also ranks 11th at his position. However, his 12 penalties this year is tied for fourth most. Garrett has rushed the passer from the right side of the defense on 97.5 percent of his snaps this season, generating a total five sacks, 10 hits and 17 hurries on 242 pass-rushing snaps. His 87.6 overall grade is the highest on the Browns’ defense and the 13th-highest among all edge defenders.